A spark plug is an electrical device that fits into the cylinder head of some internal combustion engines and ignites compressed aerosol gasoline by means of an electric spark. Spark plugs have an insulated center electrode which is connected by a heavily insulated wire to an ignition coil or magneto circuit on the outside, forming, with a grounded terminal on the base of the plug, a spark gap inside the cylinder. 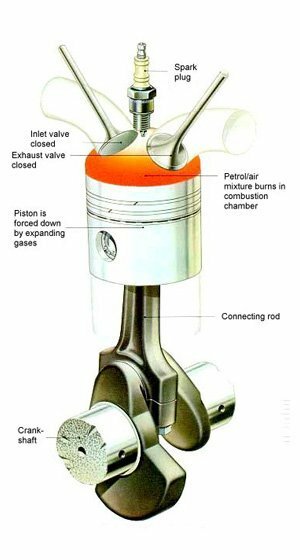 Internal combustion engines can be divided into spark-ignition engines, which require spark plugs to begin combustion, and compression-ignition engines (diesel engines), which compress the air and then inject diesel fuel into the heated compressed air mixture where it autoignites. Compression-ignition engines may use glow plugs to improve cold start characteristics. To ignite the air/fuel mixture. Electrical energy is transmitted through the spark plug, jumping the gap in the plugs firing end if the voltage supplied to the plug is high enough. This electrical spark ignites the gasoline/air mixture in the combustion chamber. To remove heat from the combustion chamber. Spark plugs cannot create heat, they can only remove heat. The temperature of the end of the plug\'s firing end must be kept low enough to prevent pre-ignition, but high enough to prevent fouling. The spark plug works as a heat exchanger by pulling unwanted thermal energy from the combustion chamber and transferring heat to the engines cooling system. 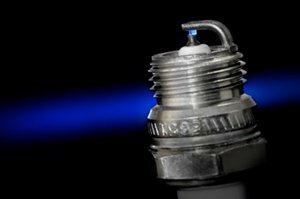 The heat range of a spark plug is defined as its ability dissipate heat from the tip. The plug is connected to the high voltage generated by an ignition coil or magneto. As the electrons flow from the coil, a voltage difference develops between the center electrode and side electrode. No current can flow because the fuel and air in the gap is an insulator, but as the voltage rises further, it begins to change the structure of the gases between the electrodes. Once the voltage exceeds the dielectric strength of the gases, the gases become ionized. The ionized gas becomes a conductor and allow electrons to flow across the gap. Spark plugs usually require voltage in excess of 20,000 volts to 'fire' properly. The heat and pressure force the gases to react with each other, and at the end of the spark event there should be a small ball of fire in the spark gap as the gases burn on their own. The size of this fireball or kernel depends on the exact composition of the mixture between the electrodes and the level of combustion chamber turbulence at the time of the spark. 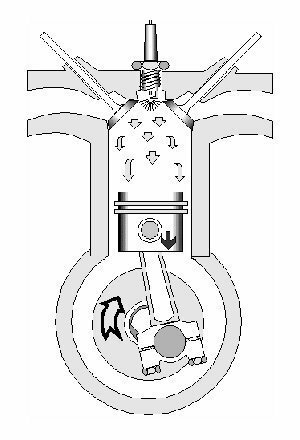 A small kernel will make the engine run as though the ignition timing was retarded, and a large one as though the timing was advanced.